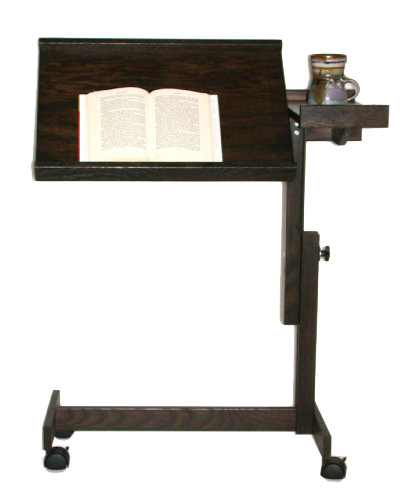 Rolling wood table can be used as a mobile laptop desk, keyboard tray, reading stand, writing slope, or overbed table. Adjustable height and tilt ease neck and back strain. As-is. While supply lasts. All sales final. 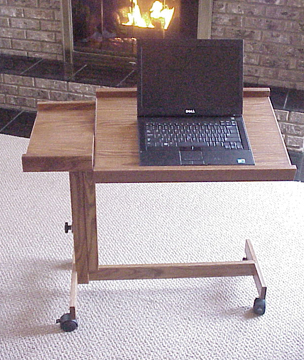 Multi-use rolling desk can be used as a mobile laptop desk, writing desk, reading table, overbed table or keyboard tray. Adjustable height and angle ease neck and back pain and improve comfort. Large tilting surface holds your book, tablet, laptop or a keyboard, while the smaller flat surface holds your mouse or cup of tea. Beautiful wood construction fits in at home or office. Just roll it to wherever you need. Ideal for use with zero-gravity recliners. Important: To protect your equipment the table should not be moved while objects are on the tilted section. Use care around rambunctious children, excited dogs, and clumsy adults. Height-adjustable from 26.5" - 40.0" (67.3 cm - 101.6 cm). Adjusts for right or left-handed use. Supports up to 40 pounds. Crafted of all-natural oak with metal fittings. Satin finished tilt top minimizes glare and reduces eye strain. Locking casters help keep the desk caddy in place. Full lip on the table supports a laptop, thick book or papers. Fixed surface: 8" x 16". Tiltable surface: 23" x 16". Gap between tabletop parts: 1/8". Footprint/base: 26" x 16" x 5" high. Requires 5½" floor clearance to roll under a chair, sofa or bed. Demo sale. As-is. No returns.